What is the mikvah for? The word “mikvah” literally means pool, or gathering of water and appears in Bresheit 1:10, when God gathers the waters on the third day: “And the gathering (mikvah) of the waters God called the Seas.” Traditionally, the mikvah was used for ritual purification for post-menstrual women and for priests in relation to Temple rituals. Ritual immersion was also a requirement for brides and converts to Judaism. Additionally, the mikvah could be used to kasher new cooking utensils if purchased from someone not Jewish. The rabbis said a community should build a mikvah even before building a synagogue or acquiring a Torah. Indeed it was permissible to sell a Torah in order to build a mikvah. Today, the mikvah is a Jewish way to mark transitional life events. The mikvah waters must be “living waters” from a natural source such as a moving body of water, rain, snow or ice. There must be at least 40 seah of water, symbolic of the 40 weeks of gestation, and 7 steps leading down into the water representing the seven days of creation. These details in the physical requirements of the immersion pool provide a deeply spiritual experience that represents rebirth, renewal and transformation. What makes a mikvah kosher and how does the Community Mikvah meet those standards? The Community Mikvah is a kosher or “proper” mikvah built and maintained under rabbinic supervision. Construction was supervised and certified by Rabbi Ben Zion Bergman of the Committee on Law and Standards. Rabbi Bergman’s Teudat Hechsher (certificate of kashrut) is displayed inside the mikvah. Rainwater is drawn through a pipe from the roof and collected in two bors that share a wall with an indoor pool. Two holes in the shared wall connect the indoor pool to each bor, allowing a small amount of rainwater to co-mingle with the chlorinated water of the indoor pool. The introduction of the living waters from the bor is what makes the indoor pool a kosher mikvah. Is there a cost for using the mikvah? It is customary to give tzedakah (a contribution) when visiting a mikvah. Please note that dollar amounts listed are suggested donations; no one will ever be turned away due to inability to make a donation. When you arrive for your appointment, you will be provided an envelope for your cash or check donation. 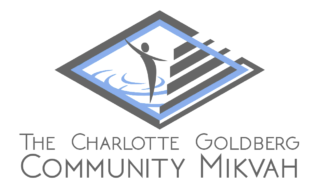 Please make checks payable to the “Charlotte Goldberg Community Mikvah Fund”. You can also pay with a credit card online here. You must be clean before entering the mikvah. A private room is provided where you can undress, remove all jewelry, shower, shampoo, brush your teeth, and remove all obstacles (physical and symbolic) between your body and the water. Please refer to the immersion guidelines below. The formal ritual of immersing in the water is simple and brief. Once in the water, the person ducks under to completely submerge for a moment or two, then recites a short blessing. The person then immerses two more times and can then leave the water when ready. If asked, an attendant may provide additional prayers, meditations, or texts relevant to the needs of the visit. The Community Mikvah provides towels, robes and all toiletries needed to prepare for immersion. However, you may bring your own supplies from home if you prefer. It is traditional for a mikvah attendant to act as a witness to make certain that you are completely submerged underwater and that your immersion is kosher. In some cases, you may choose to immerse in private with an attendant waiting at the door for safety and support. How big is the mikvah? The indoor pool is approximately 8 feet x 7 feet, and 4 ½ feet deep. It is large enough for a 6 foot tall person to immerse comfortably. The community room can accommodate approximately 40 people. The Community Mikvah is kept scrupulously clean. The water is filtered through a special system that heats and purifies the water everyday day. The water is treated with chlorine and ph levels are checked regularly. Mikvah attendants clean and prep the area before each immersion. Is it ever unsafe to immerse in the mikvah? Immersion should not take place if a person has any open cuts, sores, or communicable diseases (e.g. fever, bronchitis). Specific questions can be addressed to your physician, your rabbi, or your mikvah attendant. Can I go in the mikvah when I am menstruating? The Community Mikvah recommends postponing immersion until the completion of the menstrual cycle. However, according to Halachah (Jewish Law), a mikvah is “lo mekubal tumah” – that is, it cannot become ritually impure. Therefore, a menstruating woman does not render the mikvah ritually impure for others. Can I go in the mikvah with another person? Traditionally, mikvah immersion is an individual, personal ritual. At the Community Mikvah, one enters the mikvah area directly from the changing room so that modesty is preserved. However, the pool is large enough for two adults to immerse, and parents/guardians are encouraged to participate during conversion of a child. In such cases, adults can wear bathing suits while the child immerses. Having more than one person in the mikvah at a time is not “treif” (not kosher/proper) in any way.